She may not pay a whole lot of attention to the scoreboard, but Chelsie Sato plays smart in crunch time. The senior swingman scored five of her 20 points during a crucial fourth-quarter sequence to stifle Castle's comeback plan in McKinley's 58-45 victory last night at the Knights' gym. McKinley, the leader in the Oahu Interscholastic Association White East, improved to 9-1. Castle slipped to 4-4. Trailing by 13 in the second quarter, the host Knights chipped away against McKinley's fullcourt press and 2-3 zone. Knights center Sarah Phromisiri, held in check after a hot first quarter, came alive with a low-post bucket and two free throws to bring the Knights to within 48-43 with 6:21 remaining. That's when Sato went to work with a tough drive to the bucket, and then a 3-pointer to give the Tigers a 53-43 lead with 4:44 left. "I just saw the opening and I just went. I didn't look at the score," Sato said. McKinley's defense did the rest. Castle scored only one basket in the final 6 minutes. "Chelsie is a difficult matchup for us," Castle coach Jeff McKeown said. "She's so versatile. She can take it to the basket, post up, shoot the 3." Sato hit three treys, but also hauled in a game-high 12 rebounds, five steals and gave the Tigers much-needed balance with her attacks to the basket. Kaitlyn Ikehara shot 5-for-8 from 3-point range and had 15 points for McKinley, which finished 10-for-20 (7-for-10 in the first half) from beyond the arc. Coach Bob Morikuni had mixed feelings about his team's penchant for extremes at long range. "We can't live and die with 3s. In crunch time in the playoffs, we need good shots. We gotta work on being patient," he said. The Achilles' heel for Castle was at the foul line, where the Knights shot just 7-for-18 (39 percent). 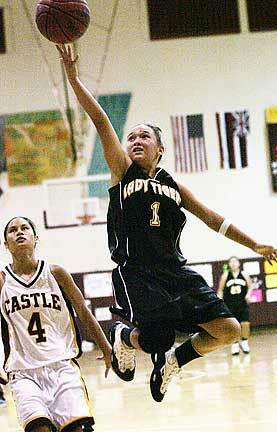 Sato had five of her team's 12 steals. Phromisiri finished with 15 points and seven rebounds, and Kori Berinobis added 10 points for Castle, which has come a long way since losing to McKinley by 22 points early in the season. "We played three quarters with them," McKeown said, watching Castle players and fans celebrate senior night after the game. "If we can compete with McKinley, we can compete with anybody." MCKINLEY--Jackie Tihano 9, Kaitlyn Ikehara 15, Chelsie Sato 20, Pearly Togiai 6, Kylie Sato 5, Jorina Faletoi 0, Crystal Tafai 3. CASTLE--Kori Berinobis 10, Candyce Ames 0, Niki Kobashigawa 6, Kelsea Berinobis 3, Sarah Phromisiri 15, Brandee Sasaki 0, Chevy Au-Stein 2, Leesha Domingo 2, Ette Amerperosa 2, Tati Dinson 5, Nicole Aberilla 0. 3-point goals--McKinley 10 (Ikehara 5, C. Sato 3, Tihano, K. Sato), Castle 2 (Kori Berinobis 2). Junior varsity--Castle 45, McKinley 41. The Surfriders held the Rainbows scoreless in the second and fourth quarters to claim their seventh division win of the season. KAILUA--Kristen Corrales 5, Tawny Kiko 7, Chelsea Babylon 0, Miki Scott 0, Tianna McKeague 4, Zsalei Kamaka 11, Pumehana Kanoa 5, Jarrish Mauhili-Kaneakua 4, Agnes Faaleaoga 0, Ashley Jacobs 4, Kahea Chang 10, Francine Sua-Godinet 2, Chevy Crowell 0. ANUENUE--Ka'imi Asing 0, Kapela Kahili 0, Kenui Wahilani 0, Leikula Gottlieb 2, Nalani Kamano 2, Pua'alekai Kimball-Aikau 2, Punawai Crawford-Kapanui 2, Naalehu Tolentino 0, Kamaile Grilho 0. 3-point goals--Kailua 2 (Corrales, Kamaka), Anuenue 0. Dianna Zane, Tiana Sugui, and Iwalani Rodrigues scored 10 points apiece to lead the top-ranked Rough Riders over the Bulldogs. KAIMUKI--Olivia Phommachanh 14, Mindy Hirokawa 2, Janelle Shimabukuro 0, Melanie Maglaya 0, Maria Colon 6, Denisha Fa'asoa 0, Sinead Scovil 6, Yunnis Rubrico 2, Monica Umeda 0, Louise Fiamate 7, Sarah Tu'akalau 0, Ashley Fortson 9. ROOSEVELT--Dianna Zane 10, Tiana Sugui 10, Iwalani Rodrigues 10, Kathleen Nakata 0, Jayna Tasaka 6, Shandree Armstead 8, Tiyana Nakasone 0, Brittni Au 3, Tasia Kamakawiwoole 8, Kaui Kuehu 5. 3-point goals--Kaimuki 3 (Phommachanh 3), Roosevelt 6 (Zane 2, Tasaka 2, Sugui, Au). C'ani Kealoha scored 21 points as the Governors knocked down four 3-pointers to open the third quarter -- including three from Elane Leaupepe -- to help knock off the Red Raiders. FARRINGTON--C'ani Kealoha 21, Jorell Telefoni-Sablan 8, Macilee Moi 1, Deja Bryce 0, Valerie Lesu 8, Angie Gasio 0, Honour Stone 0, Sandy Valdez 0, Elane Leaupepe 15, Polohiva Folaumahina 1. KAHUKU--Taeja Afalava 0, Brittney Fesolai 8, Krystle Manguba-Glover 0, LeNora Nauahi 14, Vaimalama Tito 0, Nicole Nautu 8, Keisha Moeai 5, Alayna Galeai 8, Kenra Moe 4, McZeen Ale 2. 3-point goals --Farrington 8 (Kealoha 4, Leaupepe 4), Kahuku 1 (Nauahi). The Hurricanes' Ashlee Dela Cruz attempted a deep, game-winning 3-pointer with 4 seconds left, but the ball rimmed out at the buzzer and the Lady Chargers held on for the win. PEARL CITY--Tiffany Gadingan 7, Desiree Luis 8, Kasie Kunishima 3, Kalei Adams 7, Kaiona Auyong 6, Jazmin Pahukoa-Malia 8, Patricia Langi 1, Tearaina Meyer 2. KAPOLEI--Danniel Tapat 3, Ashlee Dela Cruz 15, Regina Simanu 2, Kesha Miller 4, Tamara Satcher 3, Cassidy Calio 3, Tahnee Foki 8, Hartley Marquez 2. 3-point goals --Pearl City 0, Kapolei 0. Tiana Abbley scored 11 points to lead the No. 4 Warriors over the Owls. MID-PACIFIC--Paige Young 1, Kayla Gomes 5, Johnnelle Kapua 18, Erin Nishimura 2, Jordan Kealoha 7, Keaton McFadden 5, Jenna Savusa 4. KAMEHAMEHA--Alexis Furtado 0, Pomaikai Kalakau 2, Shaleese Javillo 4, Lindsey Wong 9, Tiana Abbley 11, Pualani Kalakau 9, Piikea Kalakau 0, Rhani Kaneaiakala 0, Alexandres-Joan Akana 4, Kylle Roy 9, Casey Lum 7. 3-point goals--Mid-Pacific 3 (Gomes, Kapua, Kealoha), Kamehameha 4 (Abbley 2, Pu. Kalakau, Wong). The No. 7 Buffanblu withstood Nicole Fu's 26 points and rode Chelsea Deptula, Devon Yamauchi, Dara Tompkison and Taj'a Wong for a combined 39 to win handily over the Spartans. MARYKNOLL--Kristen Canencia 6, Nicole Lee 2, Nicole Fu 26, Kiana Fuller 0, Amanda Macadangdang 0, Tiana Marquez 0, Kimberly Henderson 2, Melissa Ching 2, Sam Chung 3. PUNAHOU--Ciana Aiwohi 2, Ilima Macfarlane 0, Dara Tompkison 10, Erin Moon 2, Ashley Satterwhite 6, Janelle Nomura 0, Anna Merrifield 0, Chelsea Deptula 11, Devon Yamauchi 10, Taj'a Wong 8, Kysa Ludviksen 1, Tressa Torres 4, Tiera Jenson 8, Melanie Feldman 2. 3-point goals --Maryknoll 2 (Fu 2), Punahou 2 (Tompkison 2). High scorers--Kam: Brandi Kohatsu 13. SHA: Nalani Bayne 10. StA: Minna Watanabe 17, Kellee Tom 17. StF: B. Batts 19. Han: Janel Fetui 12. HBA: Carissa Onuma 10. LJ: Katlin Kahahawai 8. High scorers--Iol: Alison Nojima 16, Kimberly Hashiba 14, Kaz Masutani 12. LP: Megan Giles 12, Leah Kaina 12. StA: Maile Tua 16, Minna Watanabe 12.